Last month, we detailed how Intuit, the maker of TurboTax, has fought a proposal that could make filing taxes easier and cheaper for millions of Americans. As we noted, tax activist Grover Norquist and other conservatives have also opposed the proposal, called “return-free filing,” which would give many taxpayers the option to receive a pre-filled return that they could simply review, sign and send back, all for free. Return-free filing has been endorsed by many experts and adopted by several European countries. As it turns out, Norquist has also recently weighed in on the side of the tax prep industry on another issue. At issue is how Americans file their taxes and whether electronic filing can be offered directly through the IRS. The bill is called the Free File Program Act, co-sponsored by Rep. Peter Roskam, R-Ill. and Rep. Ron Kind, D-Wisc. It declares that the IRS, with a few narrow exceptions, “may not establish, develop, sponsor, acquire, or make available” electronic filing service or tax software. Roskam declined to comment. Spokespeople for Kind and Norquist did not immediately respond. The bill would also make permanent the Free File program, a public-private partnership between the IRS and the tax software industry created in 2002 to offer some taxpayers free electronic filing. The industry group behind the program boasts that almost all taxpayers can use software like TurboTax or more primitive electronic forms for free. But access to the more sophisticated software is limited by income. Only about 3.5 million taxpayers used Free File last year, according to a Treasury Department tally through the end of April. The pact governing the partnership, which counts Intuit as a member, includes a sweet deal for the industry: In return for the companies offering free software to some, the IRS agreed not to develop its own free, online tax prep services. The current deal expires next year. After ProPublica published a story on how Intuit, the maker of TurboTax, has successfully fought "return-free filing," we asked readers how they did their federal income taxes, and how much they paid to prepare them. Of the 596 responses, 44% of readers said they used TurboTax, with a median preparation fee of $50. Only 2% of respondents said they used FreeFileFillableForms.com, the free e-file service provided by the IRS. 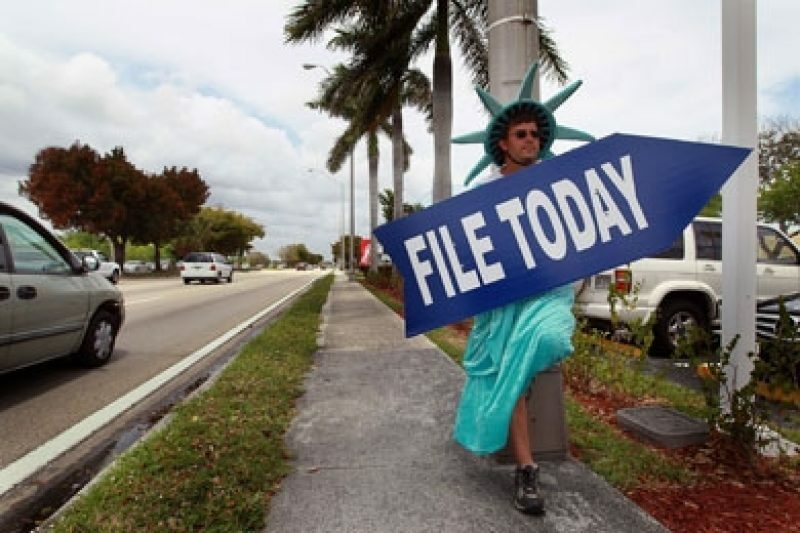 According to the treasury, 410,000 filers used Free Fillable Forms last year. Intuit lobbied on an earlier version of Roskam’s bill that was introduced in 2011. The company has spent over $11.5 million on lobbying on a range of issues in the past five years. That money buys high-profile help: Intuit’s lobbyists on the tax prep issue include former Sen. Tim Hutchinson, a Republican from Arkansas; former Rep. Pete Hoekstra, a Republican from Michigan and former Rep. Albert Wynn, a Democrat from Maryland. All three now work for the D.C. office of law firm Dickstein Shapiro. Neither the former lawmakers nor the law firm immediately responded to requests for comment. Intuit also did not respond to requests for comment. Intuit has given money to the sponsors of the bill. Roskam has received $12,500 from Intuit’s political action committee and company executives in the last two election cycles. Kind has gotten $12,400. Sen. Mark Pryor, D-Ark., introduced a companion bill in the Senate. Pryor received $3,000 from Intuit’s PAC in the last election cycle. Another recent bill would actually institute a version of return-free filing, allowing many taxpayers to avoid paying for any prep. On Friday, Rep. Bill Foster, D-Ill., introduced the bill to create a voluntary system under which an IRS website would offer individual taxpayers forms that are automatically populated with data from employers and other sources. “Our tax code is complicated enough, we shouldn’t be asking taxpayers to submit information the IRS already has,” Foster said in a press release. The bill is called the Autofill Act, and last week marks the second time Foster has introduced the legislation. A spokeswoman said Foster got interested in the issue after he became frustrated with the “redundant paperwork” needed to file his own taxes and discovered California had a state version of return-free filing. She said he will now be working to collect cosponsors and the bill is likely to be referred to the Ways and Means Committee. This doesn’t mean an anxiety-free tax season is coming soon: similar bills introduced in the past haven’t gone anywhere.